The Viceroy is now finished, furnished and ready to tour in the Grand Estates in Old Palm Golf Club. This is Courchene Development Corporationâs newest model in the neighborhood, and it is a magnificent estate beautifully situated on a lushly landscaped, one-half acre home site that borders a private water feature with several fountains. The Viceroy features a traditional split floor plan that optimizes the 5,341-square-feet under-air layout. Still, it feels even more spacious because of the natural light from the abundant floor-to-ceiling windows and glass sliders. Generous sight lines add to the proportions. For instance, the view from the foyer carries across the living room, through a bank of large windows, across the swimming pool and on to the private water feature. It makes quite a statement, as does the rest of this spectacular, one-story residence. âOnce again, Courchene has tapped into what home buyers want and designed a model that reflects all of the latest features,â says Connie McGinnis, Director of Sales. âYou canât help but be struck by the easy flow between the indoors and outdoors and the natural light that streams in, which lends the interior an immensely welcoming feel.â Insignia Design Group designed the stunning interior, relying on a palette of subdued colors and refined finishes to enhance the homeâs natural serenity. No matter which room you are in, from the spacious living room to the intimate library, the Viceroy feels like an oasis. The sprawling Master Bedroom Suite encompasses one side of the home; the other three bedrooms occupy the other side. That thoughtful separation of space imbues the Viceroy with a comforting sense of privacy. Yet the heart of the home feels wonderfully open, especially the spacious family room, kitchen and breakfast area that flow together so seamlessly with open views to the outdoor lanai, swimming pool and fountains on the well landscaped island lagoon. Exceptionally high ceilings throughout make the interior appear even more expansive. âThe dining room also makes quite the statement,â adds McGinnis. âIt flows into the living room on one side, but there is still a great sense of intimacy about it. The opposite wall is devoted to a wine room with plenty of space to showcase a collection of an ownerâs premier wines and rare vintages.â The exterior of the residence is equally inspiring. A spacious covered patio with an outdoor kitchen and fireplace opens onto the pool and spa. Coconut palms shade the backyard, bougainvillea adds splashes of color, and stately royal palms flank the driveway, which leads to the three-car garage. The Viceroy is currently Courcheneâs largest model in the Grand Estates and is available fully furnished at $4,085,000. For those seeking a slightly more intimate home, the 4,925-square-feet under-air Savoy is under construction. It features four bedrooms, five full baths, two half baths and a den. Other highlights include a glass-fronted wine wall at one end of the family room and sliders that open onto a covered lanai at the other end. 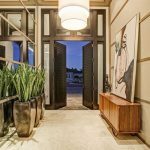 The Savoy is priced at $3,525,000 unfurnished.